Deep in the ocean, the pressure is high and the temperatures are low. However, plants and animals can still thrive in those places that were once seen as impossible for sustaining life. Far fewer varieties of plants live in the deep ocean, compared to shallower waters that receive more sunlight. Sunlight fuels photosynthesis, the process in which plants and bacteria convert energy from light into the fuel the organisms need to survive and grow. So where there's very little sunlight, only a few types of plants survive. More than 2,000 species of red algae seaweeds can be found in the ocean. They get their red color from the pigment phycoerythrin, which helps the plant photosynthesize in dim light. 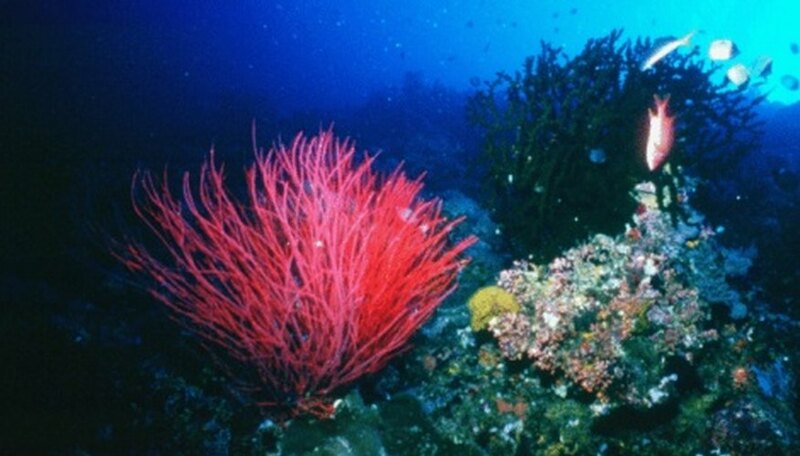 This means red algae seaweed can thrive in deeper ocean waters than many other forms of green seaweed. Despite their ability to live in deep water, red algae seaweeds still prefer tropical or temperate climates. Phytoplankton rely on sunlight to photosynthesize, so they are generally found in shallower ocean waters. However, as the tiny plants die, they drift down to the deeper levels of the sea and are eaten by the fish and other animals that live down there. Invertebrates, such as the tiny crustaceans known as amphipods, are among the organisms that rely on the sinking phytoplankton for survival. Phytoplankton are by far the most abundant type of plant in the ocean. Sea grasses were once thought to live only in shallow waters of less than 30 feet. But scientists studying the Great Barrier Reef off Australia discovered thriving sea grass beds close to 200 feet under the surface of the ocean. Water clarity and a healthy nutrient supply, as well as current action in and around the Great Barrier Reef Lagoon are credited with allowing sea grasses to live at such depths. While bacteria are not technically plants, they share some of the same genetic coding. And in the some of the deepest areas of the ocean, bacteria grow and survive near areas known as hydrothermal vents. These are fissures that allow heat to escape from the earth's core and raise temperature in the surrounding waters. As a result, bacteria grow, and fish that rely on them for food can live at depths that would normally be unable to support life. Roland, James. "Deep Ocean Plants." Sciencing, https://sciencing.com/deep-ocean-plants-13427770.html. 21 July 2017.